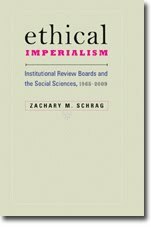 Institutional Review Blog: Can IRBs Handle the Nuances of Anthropological Ethics? Can IRBs Handle the Nuances of Anthropological Ethics? In a November 14 essay in the Chronicle of Higher Education ("New Ethical Challenges for Anthropologists"), Carolyn Fluehr-Lobban reports on the work of the Commission on Engagement of Anthropology with the U.S. Security Community, of which she is a member. The commission was established by the American Anthropological Association in 2006, in response to complaints that anthropologists had acted unethically by participating in the Department of Defense's Human Terrain System and other national security programs. even in agencies well known for their secrecy, like the Central Intelligence Agency, such terms as "transparency" and "disclosure" have become more common, and secrecy less easy to define; "classified" government documents can be accessed by scholars and journalists, while truly top-secret materials deal with intelligence research rather than anthropology. Moreover, scholars may not be able to discern whether their work contains secret material when projects are compartmentalized, and when their contribution is only a segment of a project whose wider mission is unknown. In short, anthropologists who provide "subject matter expertise" may not know the direct or indirect impact of their engagement. Anthropologists have been deployed to Iraq and Afghanistan as part of Human Terrain Teams embedded with combat troops. Part of the work they do unquestionably causes harm to some people -- but it may prevent harm to others. In addition, we know so little about what the teams do, or the projects they are part of, that objective evaluation is impossible at present. What does this tell us about IRB review of social science research? Well, that's not clear either. On the one hand, the commission asks anthropologists to "be assured that adequate, objective review of the project has been conducted, ideally by external reviewers." Ideally, decision making occurs in a group process where the relevant disciplinary, cultural, and government-agency stakeholders are at the table . . . Consultation with professionals in related disciplines who have been grappling with issues of engagement -- for example, psychologists who have debated their role in identifying what would constitute "soft torture" and their alleged involvement in interrogations in Abu Ghraib and Guantánamo -- is also recommended, as well as with those who have been historically engaged without serious controversy -- for example, political scientists working as consultants on terrorism for defense and intelligence agencies. Perhaps the best advice will come from one's own disciplinary colleagues. To that end, a group, "Friends of the Committee on Ethics," may be set up to offer informal, private advice about research ethics. As we think through the various issues that secrecy and doing no harm demand of us, such a committee will have an important role to play in helping define increasingly complex anthropological practice. These latter recommendations do suggest a role for interdisciplinary consultation, but they are no endorsement for the current IRB system, which makes no provision for assuring review by relevant stakeholders, professionals who have grappled with the issues, or disciplinary colleagues. I hope that Fluehr-Lobban's commission will explore the implications of its findings for the appropriate mechanisms of ethical review.